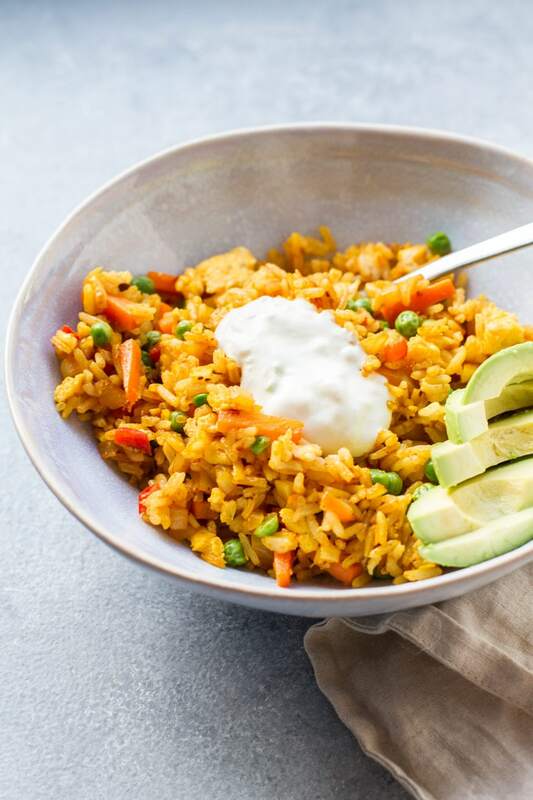 Mexican Fried Rice with a subtle sweet and smoky flavor of chipotle and the beautiful color of turmeric, gives the ultimate quick and easy lunch or side dish! 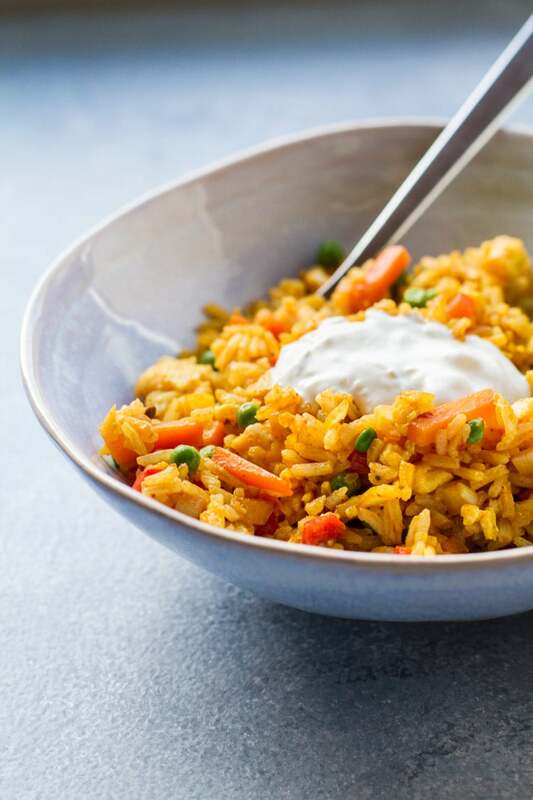 Using leftover rice, makes this a delicious one-pot meal that requires minimal work! Most of my recipes come to life from two reasons. 1: I’ve got the ingredients, and 2: I’m craving a particular cuisine. And this one is no different. I was craving chipotle in general, and had cooked rice from the day before. Could it be combined somehow? And oh boy, do I have the answer for you. (And yes, the answer is yes, if you didn’t get that). Mix eggs with 1/2 tsp garlic powder, salt and pepper. In a skillet on medium high heat, pour the eggs into the pan with a little oil. Make scrambled eggs by folding the eggs with a spatula. Read this post on chives and cheese scrambled eggs if you want a more thorough explanation of scrambled eggs. Set aside. In the same pan, fry carrot matchsticks, onion and bell pepper with chipotle paste and the rest of the spices. Fry for a couple of minutes, until vegetables reach your desired softness. I like to cook them for about 5 minutes. Add in rice and frozen peas*. Give it a good mix and then add in eggs. Pour over soy sauce. Taste and adjust seasoning with salt and pepper. * Note on the peas: I think using frozen peas are much better than fresh. This is because they retain their firmness and don’t get mushy like fresh peas. If you use fresh or canned peas I wouldn’t heat them at all. I like to serve this with avocado and a dollop of sour cream. Adding some crunchy tortilla chips and shredded Mexican cheese are also high on my list! 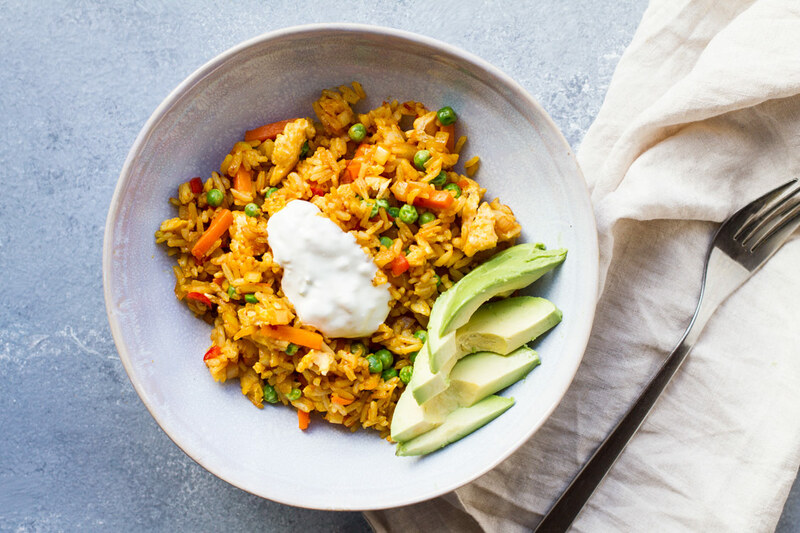 So this is a vegetarian fried rice recipe that is light enough for a lunch or as a side dish, but you may also add more toppings and protein such as chicken or pork or chickpeas for more body. I’d also love to use this fried rice in my stuffed bell peppers (see recipe below)! 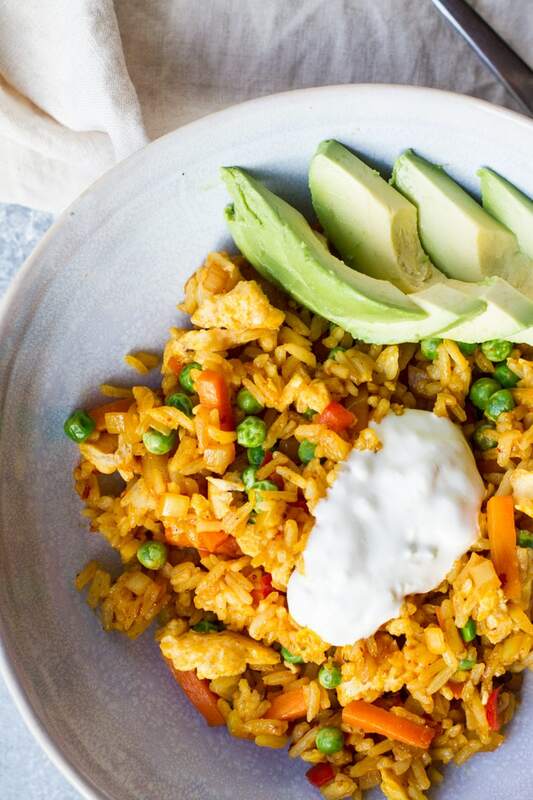 This Mexican rice is also perfect as a meal prep option. Just make it ahead, maybe even double the recipe to have on hand several days. Portion it out in microwave safe bowls and refrigerate. It could be refrigerated for up to 4 days. To reheat, microwave on medium-high for 2 minutes or until steaming. You could also heat it in a pan, if you don’t mind the extra clean-up! I’ve also compiled a list of other delicious fried rice recipes. It’s just the ultimate comfort food that is easily customizable and quick to assemble. Chinese Sesame Fried Rice – one of my all time favorite rice recipes! Rice and Beans Stuffed Bell Peppers – not using leftover rice, but it’s really easy make anyway. Fried rice is really about making something easy and delicious out of your leftovers. If you have onion, but not green onion, go ahead and use onion instead. If you don’t have carrots, use the bell pepper laying at the bottom of your veggie drawer. Mix and match and taste as you go and you will make a killer rice recipe! They can be vegetarian, pork or chicken fried rice, even tofu or chickpeas can add more body to your rice, making it a full dinner as well. Meanwhile, I’ll be munching on my Mexican fried rice filled with chipotle and turmeric. Dolloping that sour cream and topping with creamy avocados. You can’t go wrong! 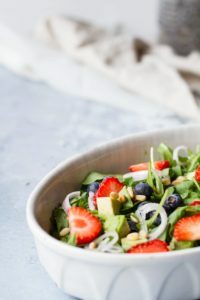 It’s a quick and easy lunch that I love and hope you will too! Make scrambled eggs: Mix eggs with 1/2 tsp garlic powder, salt and pepper. In a skillet on medium high heat, pour the eggs into the pan with a little oil. 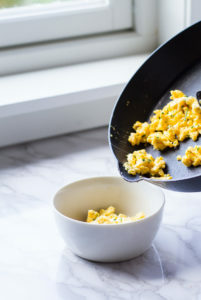 Make scrambled eggs by folding the eggs with a spatula, and set aside. Fry the rest: In the same pan fry carrot matchsticks, onion and bell pepper with chipotle paste and the rest of the spices. Fry for a couple of minutes, until vegetables reach your desired softness. I like to cook them for about 5 minutes. Add in rice and frozen peas*. Give it a good mix and then add in eggs. Pour over soy sauce. Taste and adjust seasoning with salt and pepper. Serve: I like to serve this with avocado and a dollop of sour cream. Adding some crunchy tortilla chips and shredded Mexican cheese are also high on my list! * Note on the peas: I think using frozen peas are much better than fresh. This is because they retain their firmness and don't get mushy like fresh peas. If you use fresh or canned peas I wouldn't heat them at all. Yum, this looks so good! 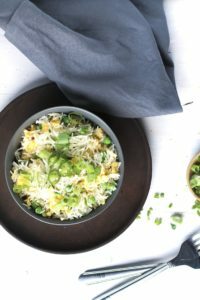 I love a good fried rice recipe, so I’m looking forward to giving this a try! 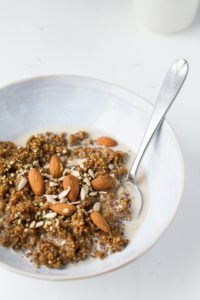 This looks like a great recipe so I rated it high even though I haven’t made it, yet! But I will, for sure. I think it’s interesting that you’ve put soy sauce in a mexican fried rice recipe but I’ll bet that just intensifies the flavors. I love rice in any form…asian, mexican, pilaf, rice pudding…you name it and if there’s rice in the recipe, I’m there! Thank you so much, Cheryl! 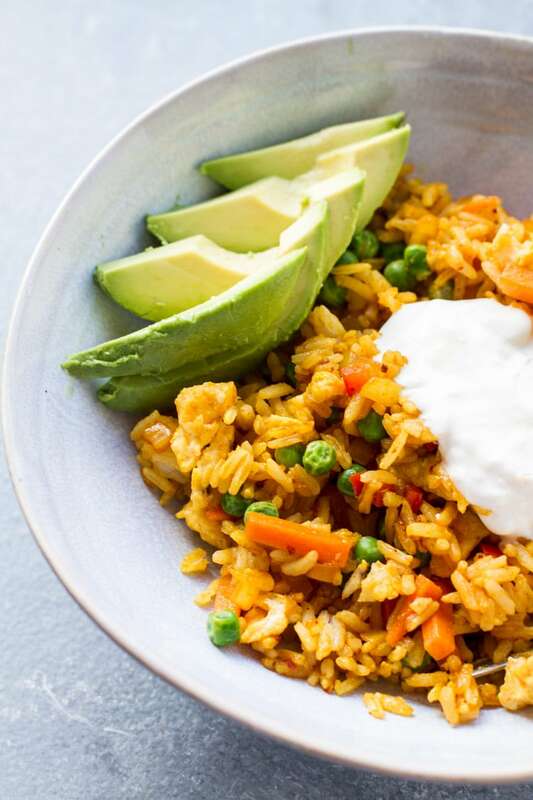 I love to use soy sauce in fried rice, so I put it into this Mexican style fried rice as well. I’m a rice girl, too! Yum! This looks incredible! I’ll have to give it a try soon! 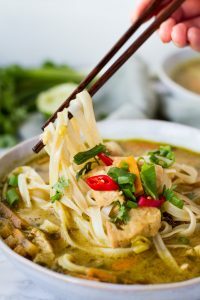 I’m all about easy one-pot meals! This looks so good! Couldn’t be much simpler, right! Thank yu! 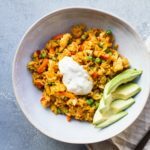 I love this new spin on traditional Mexican rice! It looks so colorful, tasty and healthy! Yum. Yum! Love the fusion of flavor. Will have to make this really soon, I always have leftover rice. I hope you’ll like it, Luci! This looks so delicious! I’m going to try it tonight! Yum this looks and sounds really good! I like it with the touch of avocado too. I’ll have to add it to my menu plan soon! If I can, I will put avocado on anything! Thank you, Carolyn! Spanish rice or paella is next on my list. Thank you! 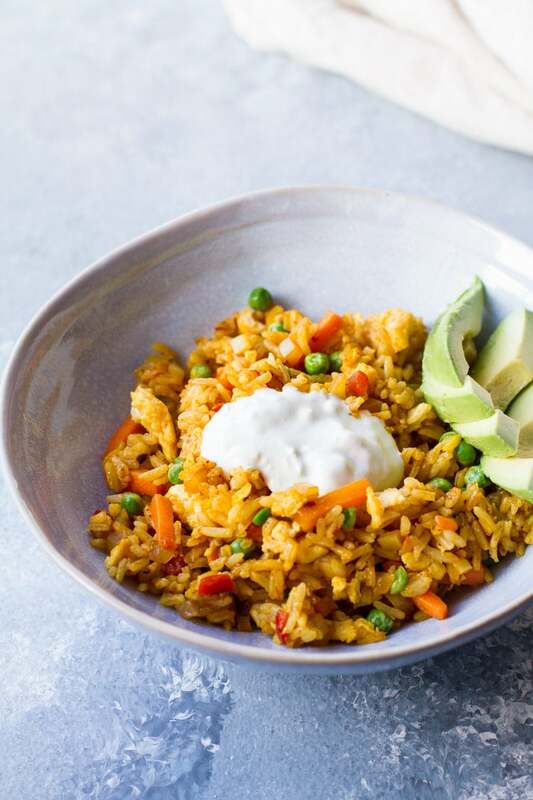 This Mexican fried rice looks absolutely delicious! I love that you added some turmeric to the seasoning because it’s not only flavorful, but so healthy for you too! Turmeric is such a healthy spice! Thank you so much, Jenni! This rice is so colourful and appealing; I’m guessing it tastes even better than it looks. I imagine it has a lovely subtle heat too. Thank you so much. Yes, it’s only a subtle heat from the chipotle. This is such a good idea! I would heap this into a tortilla with taco meat, cheese, and sour cream for sure! That sounds like my kind of dinner! Enjoy! I just love the flavors in this rice! The chipotle gives it such a nice kick. Thanks for such a delicious recipe! Thank you so much, Amanda. Chipotle is so delicious! I made chicken and rice today for dinner and I have leftover rice, that’s it. we will eat Mexican tomorrow for lunch. 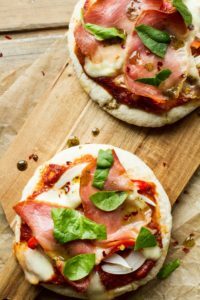 I love how easy is this recipe. That sounds like a plan. Enjoy! I can imagine that smoky flavor that chipotle has. Definitely a wonderful side dish to make every time I have some rice left from the day before! I just love chipotle. Thank you so much! If I were to choose my favorite type of rice, it would be Mexican fried. It always has that special flavor that no other rice has – just the way I truly like it. Delicious recipe! Mexican fried rice is mega delish! Thank you so much, Mimi. The fried rice sounds so easy and looks delicious as well! Will surely try this in the weekend. Thank you so much. I hope you liked it! Mexican fried rice? Now that sounds like a tasty combo of two cultures! Love the spice!